Gin, lemons, ginger. What’s not to love? Here’s a drink that’s tart and smooth, with a sweet and spicy kick. I used some of the ginger syrup left over from early April’s Lawnmower cocktail; muddled it with basil, gin and lemon juice; tossed in an egg white; and christened the delicious result a Ginger Gin Sour. Basil and ginger together? Why yes, Thailand is on to something with that flavour combo. This short cocktail will help you transition from the stiff sours of winter to the long, lemony gin drinks of summer. Method: In the base of a cocktail shaker, muddle basil gently with gin, lemon juice and ginger syrup. Add egg white and dry shake. Add ice and shake again. Strain into a chilled coupe or an ice-filled rocks glass and garnish with a basil sprig. Method: Bring the sugar and water to a boil over medium heat. Add the ginger and boil for one minute. Remove from heat and let cool to room temperature. Strain the ginger from the syrup. Store in a clean glass jar for up to one month in the refrigerator. 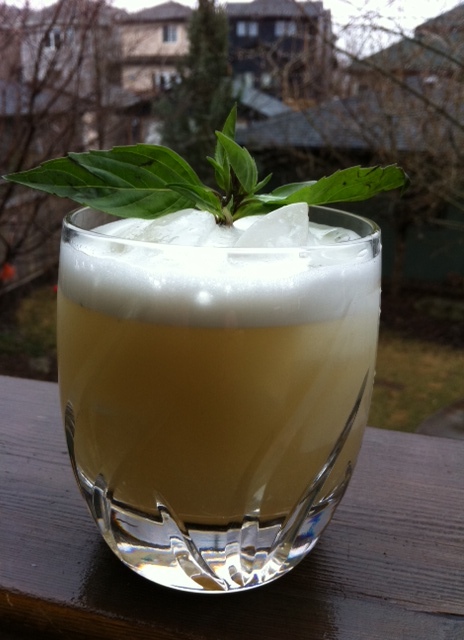 This entry was posted in Cocktails and tagged cocktails with basil, cocktails with ginger syrup, gin cocktails, ginger gin sour recipe. Bookmark the permalink.